Learning Lua can be a little tricky. The idea of variables implicitly being global can be confusing for some people, so using new users often dropped the much-needed local keyword. 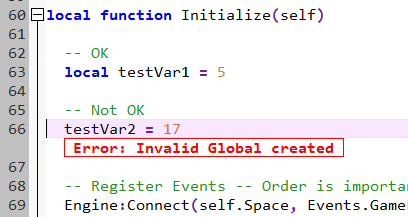 If you are concerned about accidentally creating globals there is a quick and easy check you can do you show you when/where you are creating them! To implement this we are going to create a new metatable for the globals table. If you didn’t already know, all globals in Lua are stored in a table called the “environment“. It is accessible anywhere in Lua by accessing a table called “_G“. The fact that all globals are stored in the same table allows us to take advantage of a nifty metamethod call __newindex. Control property assignment. When calling “myTable[key] = value”, if the metatable has a __newindex key pointing to a function, call that function, passing it the table, key, and value. Use “rawset(myTable,key,value)” to skip this metamethod. You can expand this idea to work with any table you’d like as well. While I won’t go into in this post, you could easily set up a system in which you must explicitly declare key/values in tables to help prevent erroneous variable creation. Hopefully this can help a few people from bashing their head on their keyboard because of a few typos! Asserts are awesome. They are one item in a programmer’s toolkit that can be seriously under-utilized. I have found them to be the most effective way to detect and fix erroneous results in my day-to-day programming. In this post I am going to be exploring a few ways we can make our own assert macro a little bit more robust. Using preprocessor directives often varies from compiler to compiler. In this example I am using Microsoft’s VC++ in VisualStudio 2013 but the features I will be using are supported in one way or another in any compiler worth using nowadays. This is pretty straight forward. If x does not evaluate to true, then we will call the __debugbreak function. This logic almost immediately fails in real-world usage though. Let’s walk through some good practices when dealing with assertion macros. Writing a macro with any logic can be tricky. If you’re not careful, debugging macros can leave you scratching your head for hours. This next method can help alleviate some of those situations. If the entity is a player, assert that they are an admin. If the entity is not a player, kill them. Assertions are great because they are a quick and easy way to ensure that your program isn’t using erroneous data, but you don’t always want them. Large projects that have hundreds of thousands of lines of code will have a lot of assertions (especially if you’re following rule #5 when writing safety critical code for NASA), so wouldn’t it be nice to have the ability to disable them? Luckily, because our assertions are in a macro, we can disable them, leaving us with virtually no overhead from them. This works because the sizeof operator is guaranteed to not evaluate the arguments to it. This should also allow the compiler to optimize the small remains of our disabled assertions. This entire line would be skipped. You will inevitably make this mistake and experience this behavior when switching to a release build and then you will never make this mistake again. Up to this point we have been under the assumption that we are always going to be attached to a debugger while running the game, so just calling __debugbreak is sufficient. If ever want to get info from an assert when not actively attached to a debugger, we’ll need to add some output to tell us what went wrong. Luckily for us most compilers have predefined macros that will help us report this info very easily. __FILE__ – Current file we are in. __LINE__ – Current line we are on. #x – Stringify ‘x’. This allows us to display the exact conditional that caused our assertion. A full list of predefined macros for MSVC can be found here. Note that we left our __debugbreak call outside of our helper function. This will cause the compiler to break on the line we put our assert on instead of breaking inside of our helper function. Define a different definition for HandleAssert based on what type of build you are using. Shipping builds should probably use a graceful crash handler/error reporter, while debug should give you the dirty details. Make the macros cross-platform. It is easy to extract the needed macros (file/line number, debug breaking) into their own user-defined macros which you can define for each platform you build on. Allow for different assertion behavior. You can have HandleAssert return a value in which you specify whether or not you want the process to halt. This can be helpful if you want to give the user an option to try to continue running the process. This is generally discouraged because you’ve probably already entered undefined behavior, so a crash is likely anyways. Leave a comment if you have any other cool tricks with asserts. They’re silly looking and stupid-easy to write, but damn are they awesome. I picked up a nifty trick recently for defining enumerations in C++ using some funky syntax that takes advantage of user-defined macros. Let us recall how simple C++ macros work. This will output a value of 5, as MYOPERATION is replaced by the preprocessor with its contents which adds the two variables. Our MYOPERATION macro does not have to add, as we could define it to do whatever we wish. We also have the ability to change what our MYOPERATION macro means mid-file. Elegance aside, this feature can help us leverage the preprocessor to do some nifty stuff for us. While this method certainly does work, it isn’t very expandable. If we add a new fruit to the enum, we must add a matching string to our array at the correct spot. Wouldn’t it be nice if we could somehow take our enumerated values and turn them all into strings? They are (for the most part) the same text after all. Well good news everyone, we can! Using the fact that we can redefine macros, we can leverage the preprocessor to generate both the enum and the array of strings for us. It is trivial to create two separate macros that generate these for us as long as we define our data correctly. Good programming practices make us want to use a header guard in all of our headers, but if we want to use our enum declaration header for more than one place then we must leave it out! This macro tells the preprocessor to append a command to our fruit names. Since they were all defined in a row in FruitDeclarations.h, this builds a nice enumeration for us. This is also a nice reminder that you can include header files in all sorts of cool places. We also need to add our count value onto the end of the list, as we did not add it in the declarations file. If you are unfamiliar with preprocessor directives, the ‘#‘ character allows us to ‘stringify’ an argument of a macro. We use this to turn all of our fruit names into C-strings in our array. Also notice how we are adding an additional string on the end of the array. This allows us to handle the user passing our fruit count into the array. Note: We must define the length of our array using our enum value ‘Count’ as the compiler doesn’t have our initializer list to deduce the length of the array. We must add one onto it for the additional ‘Invalid’ string, as the enumeration values are 0-based. And there you have it. Using this method you can easily create all sorts of automatically generated data along-side enumerations in C/C++. Please let me know in the comments below if you find any more cool tricks you can do with this method! Jake Shirley All rights reserved.